I had to come to England early to sort out passport and visa stuff. I have spent over 10 hours on buses in the last few days, going to and from London. Turned out to be a total nightmare, with the icing on the cake being a fire alarm and evacuation of the Chinese embassy! The positive side of it was an amazing surf at Kimmeridge. 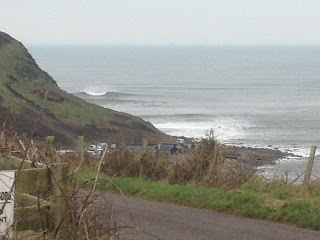 Unbelievable how good it was, with a perfect A-frame set up and waves breaking over double head. Went with Timo and we spent an hour on the rights, before moving to the lefts for an hour. Jamie Hawkins was out too and we all caught so many amazing waves. A little bit cold in the end, but worth it for sure. The temperature has now dipped below freezing, so dont think the wetsuit will be getting any more use. Next stop Maui on Sunday. First trip with baby Lily, so going to be interesting for sure.